It is time to take a vacation to an enchanted destination! You have received an invitation to travel all-inclusive to any fascinating land you admire. With all the many wonderful realms in the world, you have decided to visit one that is filled with fairies; but which unimaginable place will you pick? Lucky for you, High 5 Casino has two in mind! You can make your way to an enchanted forest, where big wins are celebrated with the soothing vocals of pixies and fairies in the Secrets of the Forest. You will be welcomed with a magical glitter-like powder from the Pixies, bringing you all the luck you need during this desirable and winning trip. Become serenaded by the soothing and charming sounds of nature while mystical pixie dust created an indescribable good time at this dreamy location. Are you seeking something a little bit more small and intimate? Why not visit the quaint garden filled with tiny fairies in Tiny Treasures! Just wait for nightfall to witness a grand surprise! Enjoy the view as their tiny delicate wings dance around and illuminate your night with magical wins! It is a sight you are not going to want to miss! Though they may be small, these little fairies can create a jackpot bonus of an evening! Which enchanted destination will you travel to? Do you prefer to visit the forest filled with secret pixies or a magical garden with sparkling excitement? Comment in the conversation bubble located on the top right corner of your screen and let us know! 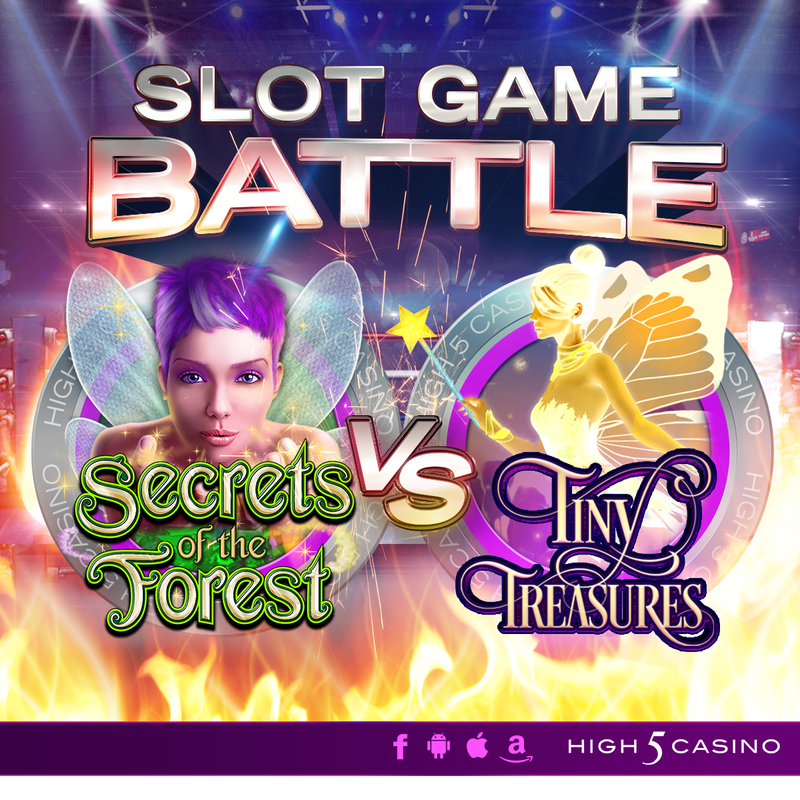 This entry was posted in High 5 Casino, High 5 Fight Club, High 5 Games, Slot Game Battle and tagged Android, Apple, Facebook, Free Games, game vs. game breakdowns, H5C, High 5 Casino, High 5 Casino Mobile, High 5 Games, Secrets of the Forest, social gaming, Tiny Treasures, Tumbling Reels by hoothigh5. Bookmark the permalink.